Recently, the Hog Roast Carlisle team were hired by a local client to help them create a surprise birthday party. The event was hosted at their home in Carlisle and the clients created their own homemade bar called ‘Bar 148’, which was named after their house number, for the occasion. The food was served as a buffet to compliment the casual atmosphere. The clients chose Menu Three for the Hog Roast Carlisle team to create. This menu consisted of a traditional slow cooked hog which was roasted for several hours. The team ensured that they arrived at the venue many hours in advance to the serve time so they could set up and begin cooking and preparing their food. The hog was cooked in one of the Hog Roast team’s Hog Master machines and was laid along the buffet table as the centrepiece. The roasted hog was served with apple sauce, crispy crackling and homemade stuffing. Moreover, on request of the client, the Hog roast Carlisle team also added sausages to the menu for their guests. Alongside the meats, fresh bread rolls and wraps were served in wicker baskets. In addition to the meat, the clients also selected a vegetarian option of grilled vegetable skewers as an alternative. The hog roast was to be served to 40 people and so was important that the quality of the food remained consistent. In addition, as the service ran through the evening, and the buffet was served outside, it was important for the team to keep the food warm and did this by serving the meats in professional heated metal serving dishes. 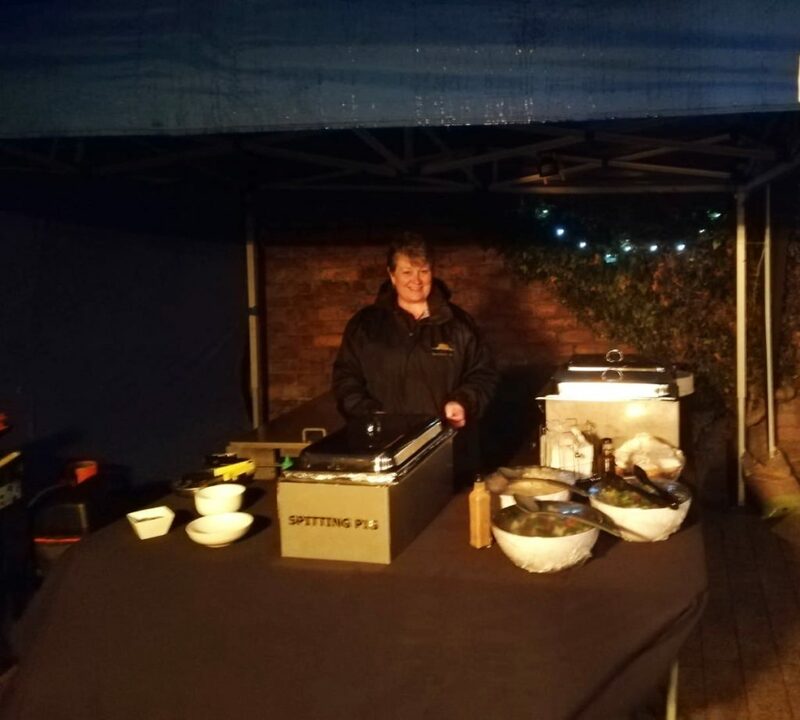 The food was served on the client’s request at 7:45pm and the Hog Roast Carlisle team received some fantastic feedback on the food. The buffet was laid out under a marquee in the client’s garden that had been decorated with fairy lights and looked lovely alongside a roaring fire pit on the client’s patio. The client’s homemade bar also looked brilliant and fitted the rustic atmosphere of the hog roast perfectly. The service ran really smoothly and the team were pleased that they could help make the birthday party special.